Porous tantalum modular augments combined with trabecular metal acetabular components can be used effectively in reconstructing failed THA with severe acetabular bone loss. Its material properties and unique structure allow for increased structural stability and promote biologic fixation. By 2030, the demand for revision total hip arthroplasties (THA) is expected to grow by 137% to nearly 100,000 annual procedures. The increase in volume coupled with the younger age at which patients are undergoing THA will lead to bony deficiencies becoming more common. [1,2] Revision surgery must provide a stable, durable construct that reproduces the hip center of rotation, offset, and limb length while also preserving the soft-tissue envelope. However, massive acetabular bone loss during revision THA remains a challenging problem. 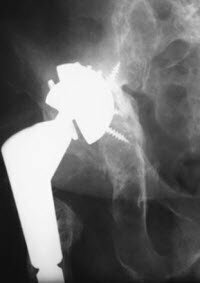 Maximizing stability and intimate host bone contact with uncemented acetabular components is essential to obtain osseointegration. This requires acetabular implants with enhanced biologic and mechanical properties. All patients undergoing acetabular component revision should have a thorough history and physical examination. In addition, serum erythrocyte sedimentation rate (ESR) and C-reactive protein (CRP) levels should be obtained in all revision cases. If there is any suspicion for infection, then a preoperative hip aspiration should be completed to assess the cell count with differential and cultures. Figure 1. Preoperative (left0 and postoperative (right) anteroposterior (AP) radiographs of a patient with a failed right acetabular component requiring revision with a highly porous acetabular component and porous tantalum modular augment. Occasionally, a computerized tomography (CT) scan may be obtained to estimate the amount of anticipated bone loss, particularly in cases in which the acetabular component is medial to Kohler’s line, retained cement is present, and/or previous screws are present. Contrast may be required to evaluate the proximity of the pelvic vessels, ureter, and bladder to the acetabular component. It is not our routine practice to obtain CT scans, however, because the slow migration of components medially into the pelvis is accompanied by development of a thick reactive scar and granulation tissue layer that protects the deeper anatomic structures. In addition, the intraoperative findings, both in regards to the quantity and geometry of bone loss, often vary after the removal of the prostheses from that which is suggested by preoperative imaging. Preoperative CT scan or axial imaging is most helpful in cases in which screws or cement were placed into an intrapelvic position acutely at the time of prior surgery and may very well encase or impinge on vascular or neurologic structures. In selected instances, controlled intrapelvic removal via a separate incision may be required. Acetabular bone loss is most commonly classified according to the American Academy of Orthopaedic Surgeons (AAOS) or Paprosky  classifications. Intraoperative assessment is utilized as the standard when classifying the defects. The AAOS classification is based on the presence of segmental, cavitary, or combined defects (Table 1). Although this classification is simple in its organization, it is not quantitative and thus is limited in its practical application. In Type I defects, the acetabulum is maintained as a hemisphere. There is no hip migration, destruction of the teardrop or ischial osteolysis, or disruption of Kohler’s line. Type IIA defects result in superior acetabular dome bone loss, but less than 3 cm of superior hip migration. There is no ischial or teardrop osteolysis, and Kohler’s line remains intact. Type IIB defects also have less than 3 cm of superior and lateral hip center migration, but ischial osteolysis is present. Typically, Kohler’s line is intact and there is minimal teardrop osteolysis. Type IIC defects are medial wall deficiencies in which Kohler’s line is disrupted and there is moderate teardrop and ischial osteolysis. In Type IIIA defects, there is greater than 3 cm of superolateral femoral head center migration, 30-60% of the acetabular rim is missing, and the columns are non-supportive. Although there is moderate ischial and teardrop osteolysis, Kohler’s line remains intact. In Type IIIB defects, the acetabular rim and columns are completely non-supportive and the hip center migrates greater than 3 cm superomedially. There is severe ischial and teardrop osteolysis with complete disruption of Kohler’s line. Porous tantalum has a variety of applications in adult reconstructive surgery. The senior authors (D.G.L. and A.D.H.) assisted in the design and development of the porous tantalum revision trabecular metal shells (Zimmer; Warsaw, Indiana) and porous tantalum modular augments (Zimmer; Warsaw, Indiana), as well as techniques for their use in acetabular defect management. The low modulus of elasticity and high porosity allow for a more uniform stress transfer pattern and the possibility of decreased stress shielding. The primary disadvantages of porous tantalum modular augments are their initial expense and the potential technical challenge involved in subsequent removal of a well-fixed implant if required for the treatment of late hematogenous deep periprosthetic infection. If left prominent and uncovered by bone or bone graft material, the material may be irritating to surrounding soft tissues because of its high coefficient of friction. The use of an augment does not allow for full restoration of bone stock for future revisions. The long-term durability of these constructs beyond the first decade remains to be documented. There are several indications for porous tantalum modular augments. In general, patients with Paprosky Type I-IIC defects can be treated with an uncemented hemispheric implant with bone grafting. Typically, porous tantalum modular augments are indicated for Paprosky Type IIIA and IIIB defects. However, their use is often employed in a host of Type II defects. The patient is positioned, prepped, and draped in the usual fashion, generally with the patient in a lateral decubitus position. The surgical exposure is completed through the approach most familiar to the surgeon, with extensile versions often helpful. The surgeon must obtain sufficient exposure to perform an accurate assessment of the acetabular bone loss. In cases in which acetabular component revision is required, component removal with the least amount of additional bone loss and preservation of key bone stock is paramount. Complete circumferential exposure of the acetabular rim is essential for safe component removal. Both the quantity and location of bone must then be noted and considered in the assessment of whether a porous tantalum modular augment is required, or whether a hemispherical cup with multiple screws can be used alone. The decision to use modular acetabular augments is made intraoperatively based on the presence of a segmental or large cavitary acetabular bone deficiency and an inability to use a porous hemispherical component alone to achieve adequate contact area and mechanical support on host bone. Once the decision to use an augment has been made, conventional reamers with increasing diameters are used to shape the oval acetabular defect to a size constrained by the anterior and posterior acetabular walls. The acetabular component may be placed first, followed by the augment, or the real acetabular augment may be impacted into a medial position or fixed to the host bone through screw holes in the augments followed by cup placement against the augment. While either method can be used with peripherally placed augments, the authors’ preference is currently to place the cup first and augment second when possible, as this is technically quicker and easier (Figure 2). Figure 2. Intraoperative photograph with the highly porous trabecular metal acetabular component joined to the augment with acrylic bone cement and multiple bone screws. The uncemented porous acetabular component and augment are always joined with a layer of polymethylmethacrylate (PMMA) between the augment and cup to unite the construct. Additional screws are used to enhance fixation of the cup to the pelvis (Figure 3). Figure 3. Intraoperative photograph with the highly porous trabecular metal acetabular component joined to the pelvis with multiple bone screws. After completing the fixation of the augment and cup with screws, the augment fenestrations and remaining cavitary defects are filled with either morcellized cancellous bone graft or a bone graft substitute. Depending on which acetabular component is utilized, a polyethylene liner may be cemented into the socket, providing fixation of the screw heads and a locking screw effect. If this is the case, the unused screw holes are filled with bone wax or bone graft to avoid intrusion of bone cement into the bone implant interface. 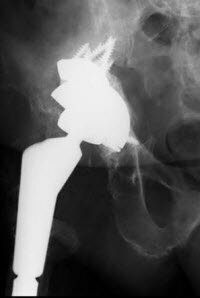 Failure to remove all fibrous and osteolytic tissue from the acetabulum will make it difficult to accurately determine the correct size and position of the porous metal augments. Augments are available in various heights (ie, 10 mm, 15 mm, 20 mm, and 30 mm) and diameters that can be mixed and matched to facilitate defect and cup contact. Excessive removal of viable bone should be avoided. The goal is to match the implant construct to the patient, as opposed to making the patient match the available devices. Additional screw holes can be made in the porous tantalum revision shell with a high-speed burr to further enhance fixation, especially inferiorly in the region of the ischium and posterior inferior iliac spine to prevent early zone 3 separation (Figure 4). Figure 4. Intraoperative photograph illustrating the creation of additional screw holes with a high-speed burr. The senior authors (D.G.L. and A.D.H.) have described their very initial series of porous tantalum modular augments for severe acetabular bone loss during revision THA. Nehme, Lewallen, and Hanssen investigated 16 revision THAs requiring the use of porous tantalum modular augments for a variety of Type II and Type III acetabular bone defects (Table 3). At a mean follow-up of 32 months, no implant had evidence of migration or loosening. Postoperatively, the prosthetic femoral head centers were located at a mean horizontal distance of 8 mm less and at a mean vertical distance of 20 mm less than pre-revision. 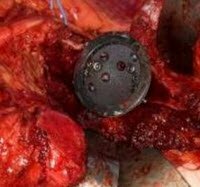 Sporer and Paprosky reviewed the outcomes of 28 patients with Type IIIA defects treated with uncemented hemispherical sockets used in conjunction with modular porous metal augments. At a mean of 3.1 years, all patients had radiographically stable constructs. Only 1 patient was revised for recurrent instability. Van Kleunen et al described comparable results when analyzing 97 hips (90 patients) with Paprosky Types II, IIIA, and IIIB defects that were managed with a comparable construct. There were no cases of aseptic loosening at mean follow-up of 45 months. Lingaraj et al reviewed 17 Type IIIA and six Type IIIB defects. At a mean follow-up of 41 months, 22 of 23 components were well fixed. Weeden and Schmidt reported a series of 43 patients with Type IIIA and IIIB defects treated with porous tantalum acetabular implants, of which 26 cases had porous tantalum modular augments as well. The overall success rate was 98% at a mean follow-up of 2.8 years. Siegmeth et al reviewed their first 37 patients who were reconstructed with a trabecular metal augment combined with a trabecular metal shell. At a mean follow-up of 34 months, 94% of the acetabular components were osseointegrated. However, the technique preferred by these authors avoided cement between the augment and acetabular component, which may have decreased initial construct stability in those cases with aseptic loosening. Porous tantalum modular augments combined with trabecular metal acetabular components can be used effectively in the reconstruction of failed THA with severe acetabular bone loss. Its material properties and unique structure allow for increased structural stability and promote biologic fixation. Long-term follow-up into the second decade postsurgery and comparison with alternative reconstructive techniques will be required to evaluate whether this technique will provide durable long-term outcomes. Matthew P. Abdel, MD, is Assistant Professor of Orthopaedic Surgery, Department of Orthopaedic Surgery, Mayo Clinic, Rochester, Minnesota. David G. Lewallen, MD, is Professor of Orthopaedic Surgery, Department of Orthopaedic Surgery, Mayo Clinic, Rochester, Minnesota. Arlen D. Hanssen, MD, is Professor of Orthopaedic Surgery, Department of Orthopaedic Surgery, Mayo Clinic, Rochester, Minnesota. The authors did not receive any outside funding or grants in support of their research for or preparation of this work. One of the authors (ADH), or a member of his or her immediate family, received, in any one year, payments or other benefits in excess of $10,000 or a commitment or agreement to provide such benefits from a commercial entity (Zimmer and Stryker) for products discussed in this article. Another author (DGL), or a member of his or her immediate family, received, in any one year, payments or other benefits in excess of $10,000 or a commitment or agreement to provide such benefits from a commercial entity (Zimmer) for products discussed in this article. No commercial entity paid or directed, or agreed to pay or direct, any benefits to any research fund, foundation, division, center, clinical practice, or other charitable or nonprofit organization with which the authors, or a member of their immediate families, are affiliated or associated. Kurtz S, Ong K, Lau E, Mowat F, Halpern M. Projections of primary and revision hip and knee arthroplasty in the United States from 2005 to 2030. The Journal of bone and joint surgery. American volume 2007;89-4:780-5. Kurtz SM, Lau E, Ong K, Zhao K, Kelly M, Bozic KJ. Future young patient demand for primary and revision joint replacement: national projections from 2010 to 2030. Clinical orthopaedics and related research 2009;467-10:2606-12. Siegmeth A, Duncan CP, Masri BA, Kim WY, Garbuz DS. Modular tantalum augments for acetabular defects in revision hip arthroplasty. Clinical orthopaedics and related research 2009;467-1:199-205. Templeton JE, Callaghan JJ, Goetz DD, Sullivan PM, Johnston RC. Revision of a cemented acetabular component to a cementless acetabular component. A ten to fourteen-year follow-up study. The Journal of bone and joint surgery. American volume 2001;83-A-11:1706-11. Chen WM, Engh CA, Jr., Hopper RH, Jr., McAuley JP, Engh CA. Acetabular revision with use of a bilobed component inserted without cement in patients who have acetabular bone-stock deficiency. The Journal of bone and joint surgery. American volume 2000;82-2:197-206. Dearborn JT, Harris WH. High placement of an acetabular component inserted without cement in a revision total hip arthroplasty. Results after a mean of ten years. The Journal of bone and joint surgery. American volume 1999;81-4:469-80. Dearborn JT, Harris WH. 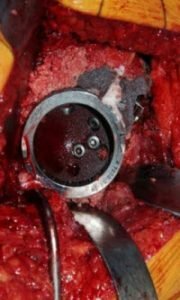 Acetabular revision arthroplasty using so-called jumbo cementless components: an average 7-year follow-up study. The Journal of arthroplasty 2000;15-1:8-15. Gross AE, Goodman S. The role of cages and rings: when all else fails. Orthopedics 2004;27-9:969-70. Gross AE, Goodman S. The current role of structural grafts and cages in revision arthroplasty of the hip. Clinical orthopaedics and related research 2004-429:193-200. Schreurs BW, Bolder SB, Gardeniers JW, Verdonschot N, Slooff TJ, Veth RP. Acetabular revision with impacted morsellised cancellous bone grafting and a cemented cup. A 15- to 20-year follow-up. The Journal of bone and joint surgery. British volume 2004;86-4:492-7. Sheth NP, Nelson CL, Springer BD, Fehring TK, Paprosky WG. Acetabular bone loss in revision total hip arthroplasty: evaluation and management. The Journal of the American Academy of Orthopaedic Surgeons 2013;21-3:128-39. Shinar AA, Harris WH. Bulk structural autogenous grafts and allografts for reconstruction of the acetabulum in total hip arthroplasty. Sixteen-year-average follow-up. The Journal of bone and joint surgery. American volume 1997;79-2:159-68. Whaley AL, Berry DJ, Harmsen WS. Extra-large uncemented hemispherical acetabular components for revision total hip arthroplasty. The Journal of bone and joint surgery. American volume 2001;83-A-9:1352-7. Meneghini RM, Meyer C, Buckley CA, Hanssen AD, Lewallen DG. Mechanical stability of novel highly porous metal acetabular components in revision total hip arthroplasty. The Journal of arthroplasty 2010;25-3:337-41. Nehme A, Lewallen DG, Hanssen AD. Modular porous metal augments for treatment of severe acetabular bone loss during revision hip arthroplasty. Clinical orthopaedics and related research 2004-429:201-8. Lingaraj K, Teo YH, Bergman N. The management of severe acetabular bone defects in revision hip arthroplasty using modular porous metal components. The Journal of bone and joint surgery. British volume 2009;91-12:1555-60. Sporer SM, Paprosky WG. The use of a trabecular metal acetabular component and trabecular metal augment for severe acetabular defects. The Journal of arthroplasty 2006;21-6 Suppl 2:83-6. Van Kleunen JP, Lee GC, Lementowski PW, Nelson CL, Garino JP. Acetabular revisions using trabecular metal cups and augments. The Journal of arthroplasty 2009;24-6 Suppl:64-8. Weeden SH, Schmidt RH. The use of tantalum porous metal implants for Paprosky 3A and 3B defects. The Journal of arthroplasty 2007;22-6 Suppl 2:151-5. Sambaziotis C, Lovy AJ, Koller KE, Bloebaum RD, Hirsh DM, Kim SJ. Histologic Retrieval Analysis of a Porous Tantalum Metal Implant in an Infected Primary Total Knee Arthroplasty. J Arthroplasty 2011. Tigani D, Sabbioni G, Raimondi A. Early aseptic loosening of a porous tantalum knee prosthesis. La Chirurgia degli organi di movimento 2009;93-3:187-91. D’Antonio JA, Capello WN, Borden LS, Bargar WL, Bierbaum BF, Boettcher WG, Steinberg ME, Stulberg SD, Wedge JH. Classification and management of acetabular abnormalities in total hip arthroplasty. Clinical orthopaedics and related research 1989-243:126-37. Paprosky WG, Perona PG, Lawrence JM. Acetabular defect classification and surgical reconstruction in revision arthroplasty. A 6-year follow-up evaluation. The Journal of arthroplasty 1994;9-1:33-44. Meneghini RM, Lewallen DG, Hanssen AD. Use of porous tantalum metaphyseal cones for severe tibial bone loss during revision total knee replacement. J Bone Joint Surg Am 2008;90-1:78-84. Meneghini RM, Lewallen DG, Hanssen AD. Use of porous tantalum metaphyseal cones for severe tibial bone loss during revision total knee replacement. Surgical technique. J Bone Joint Surg Am 2009;91 Suppl 2 Pt 1:131-8. Cohen R. A porous tantalum trabecular metal: basic science. Am J Orthop (Belle Mead NJ) 2002;31-4:216-7. Jensen CL, Petersen MM, Schroder HM, Lund B. Bone mineral density changes of the proximal tibia after revision total knee arthroplasty. A randomised study with the use of porous tantalum metaphyseal cones. International orthopaedics 2012. Bobyn JD, Poggie RA, Krygier JJ, Lewallen DG, Hanssen AD, Lewis RJ, Unger AS, O’Keefe TJ, Christie MJ, Nasser S, Wood JE, Stulberg SD, Tanzer M. Clinical validation of a structural porous tantalum biomaterial for adult reconstruction. J Bone Joint Surg Am 2004;86-A Suppl 2:123-9. Jones RE, Skedros JG, Chan AJ, Beauchamp DH, Harkins PC. Total knee arthroplasty using the S-ROM mobile-bearing hinge prosthesis. J Arthroplasty 2001;16-3:279-87. Welldon KJ, Atkins GJ, Howie DW, Findlay DM. Primary human osteoblasts grow into porous tantalum and maintain an osteoblastic phenotype. Journal of biomedical materials research. Part A 2008;84-3:691-701. Findlay DM, Welldon K, Atkins GJ, Howie DW, Zannettino AC, Bobyn D. The proliferation and phenotypic expression of human osteoblasts on tantalum metal. Biomaterials 2004;25-12:2215-27. Bobyn JD, Stackpool GJ, Hacking SA, Tanzer M, Krygier JJ. Characteristics of bone ingrowth and interface mechanics of a new porous tantalum biomaterial. The Journal of bone and joint surgery. British volume 1999;81-5:907-14. Schildhauer TA, Robie B, Muhr G, Koller M. Bacterial adherence to tantalum versus commonly used orthopedic metallic implant materials. Journal of orthopaedic trauma 2006;20-7:476-84. Schildhauer TA, Peter E, Muhr G, Koller M. Activation of human leukocytes on tantalum trabecular metal in comparison to commonly used orthopedic metal implant materials. Journal of biomedical materials research. Part A 2009;88-2:332-41. Black J. Biological performance of tantalum. Clinical materials 1994;16-3:167-73.